Delicious, down to the last bite! On our way to our grand-nephews wedding in Alabama back in June we decided to break up the almost 800 mile drive by spending the night in Meridian, Mississippi. As usually, I’m online searching for a restaurant that we want to try and this little gem of a restaurant caught my attention — Harvest Grill. It has a relaxed, casual feel and an inventive menu, just our type of place. The restaurant was having some sort of brew event on the patio when we got there but we decided to get out of the heat and sit inside. We sometimes like to order from the appetizer menu so we can try several things and save room for dessert; which we did this night and tried their creole bread pudding with caramel and white chocolate shavings with scoops of ice cream between the four small squares of bread pudding — fantastic. Now back to some of their appetizers. My husband ordered oysters on the half shell then another order of Black and Blue Oysters (steak and blue cheese). 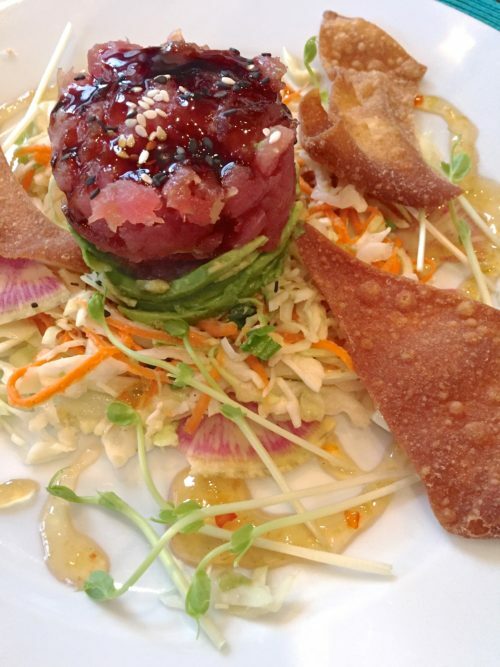 I knew when we were still 100 miles away I would be trying their Tartare Nachos — Ahi tuna over Asian slaw with avocado edamame and a habanero peach glaze and wasabi aioli; I loved the crunch of the wonton crisp, the heat from the wasabi and the peach glaze and the sesame flavor of the slaw. All my favorite ingredients and now I was going to have to come up with a recipe to make this exciting, tasteful dish. The recipe below is what I came up with and I decided to email the chef about the sauces on the place. By the time I had served this to company and done the dishes, the chef had emailed me back telling me how he made the dish. A few of the things I got wrong but overall it was pretty much spot on. I think his wasabi aioli was what held his slaw together whereas I used some sesame oil and rice vinegar. Also, he made a ginger glaze and the peach glaze. I cheated (didn’t know the recipe then) and bought a jar of habanero peach jelly and melted it. Worked just fine. I will try his ginger glaze recipe the next time. 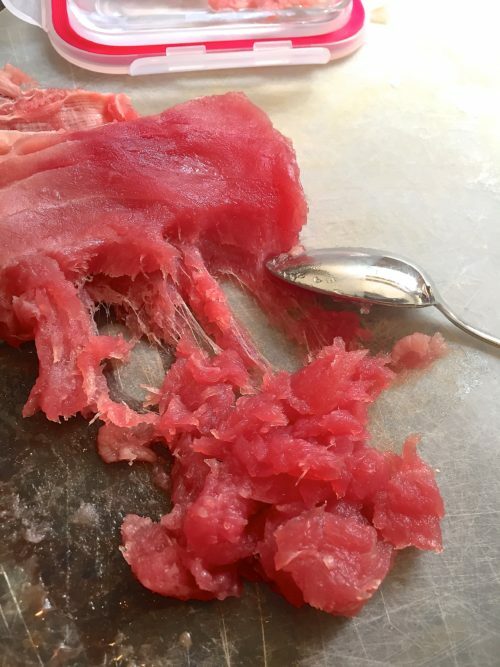 There’s a method of making the tuna (like for spicy tuna in sushi) that I learned from a cooking class several years ago; you simply take a spoon and start scraping the tuna steak and little pieces of tuna will just roll off the spoon, leaving behind the white membrane of the tuna steak. I always buy the individual frozen tuna steaks since one of the seafood guys at the grocery told me that it would be sushi grade. What will I do the next time? — Well, I will make a wasabi aioli and mix that with the slaw for a little more hotness, I will add a handful of shelled edamame to the slaw (I forgot that part of the recipe because I didn’t go back and read menu before making my version), I will NOT over cook my wonton chips and may try baking them in the oven. Overall, I did a pretty good job of recreating Harvest Grill’s recipe and thank them so much for sharing the parts of the recipe I was not sure of. Hope you will give this a try; make either individual ones like I did or make a larger one for a group to share. BLAST FROM THE PAST: Who doesn’t like deviled eggs? Well, I do know one friend but usually the deviled egg tray will be the first thing that is emptied at a party. Try my Cobb Deviled Eggs for any of your outdoor/indoor parties this summer. Some of the ingredients for this dish. 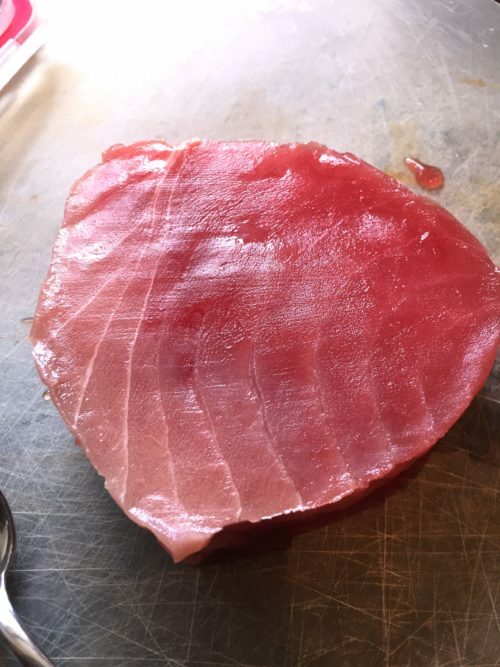 These tuna steaks I buy frozen and have on hand anytime I want to make a dish like this. Use a spoon and start scraping the tuna steak. 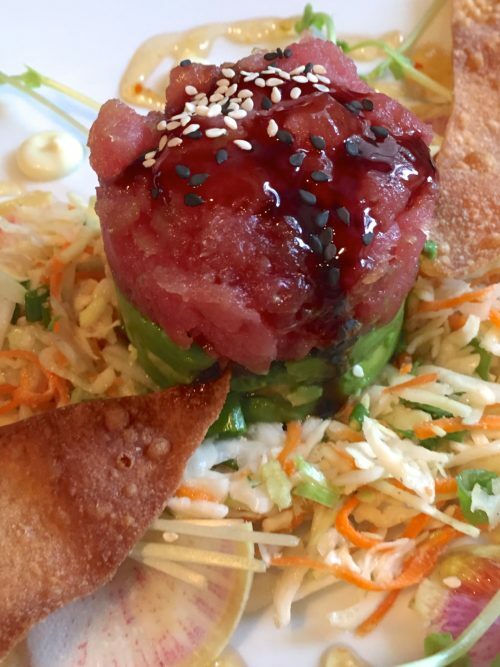 You will get something that looks like scraped tuna. This is a lot easier than trying to finely chop fresh tuna. For the slaw, I used shredded carrots, angel hair cabbage, some fresh ginger and green onions. I used sesame oil and rice vinegar to moisten it. 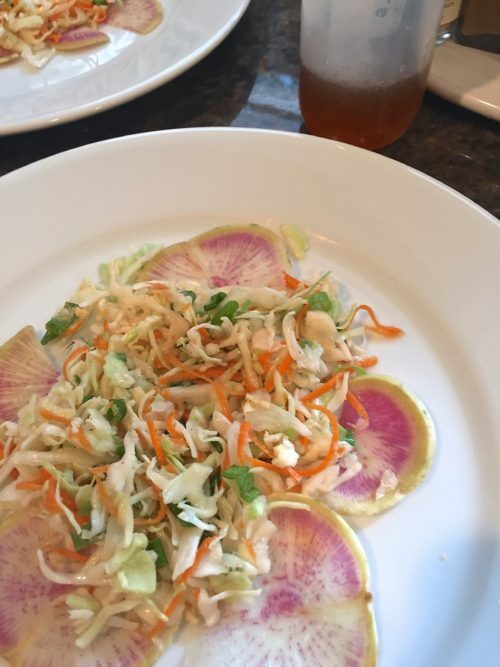 After I made the recipe I realized that the restaurant had used a wasabi aioli for the slaw. I will do it that way the next time. I used some wasabi powder with water. I dotted tis on the plate for a little extra heat. 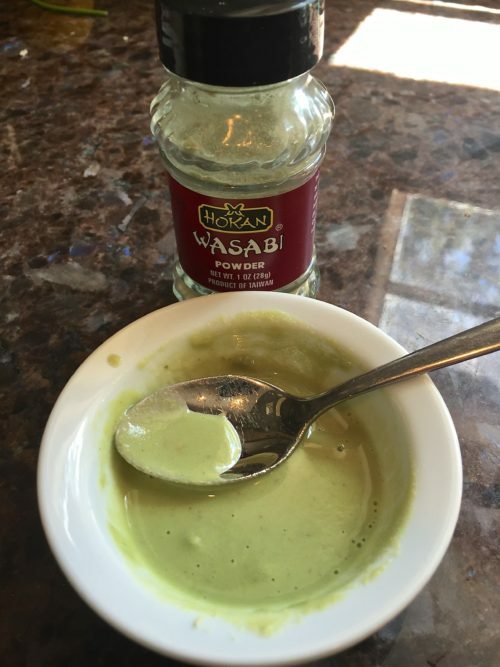 You could make the wasabi aioli like the restaurant and mix it with the slaw or just mix some wasabi powder or paste with a little mayo and add to your slaw. If you don’t want any additional mayo added to this recipe make it my way with the sesame oil and rice vinegar. 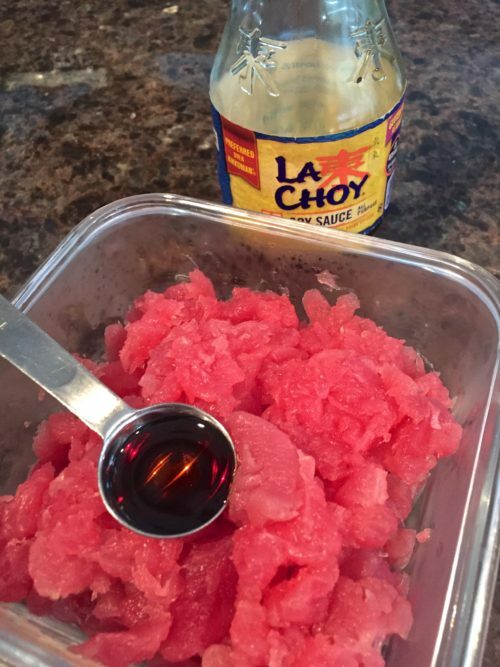 Add soy sauce to taste to your scraped or chopped tuna. 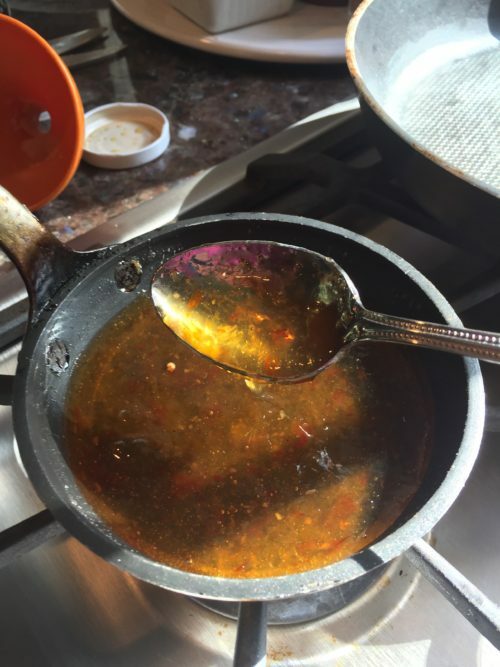 Melt the habanero peach jelly in small sauce pan. You will drizzle this on the plate. Or, you could make your own peach glaze. Drizzle some of the melted peach habanero jelly on the plate then add some of the slaw and the watermelon radish slices. 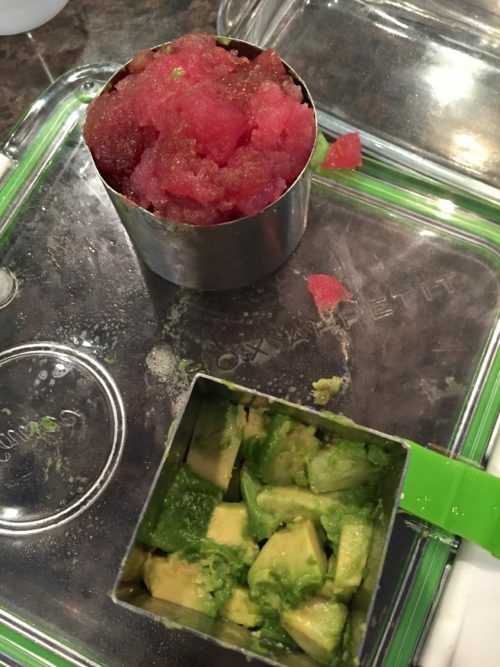 Pack some of the sliced or peeled avocado into the bottom half of a mold, then top with the tuna. Drizzle plate with more of the jelly and add some sweet soy or soy sauce to the top of the tuna mold. Sprinkle with some black and/or white sesame seeds. Surround with a bunch of wonton crisp. 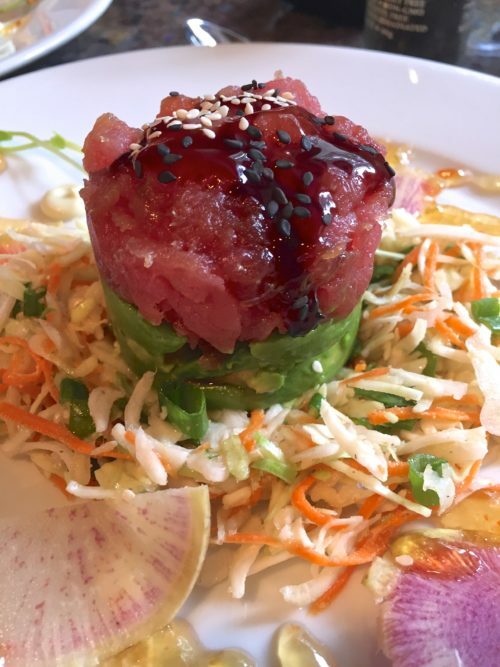 A perfect bite would be a chip with a little of the slaw, the jam, a piece of the watermelon radish and some of the avocado and tuna. Enjoy. pea shoots or shelled edamame for garnish. 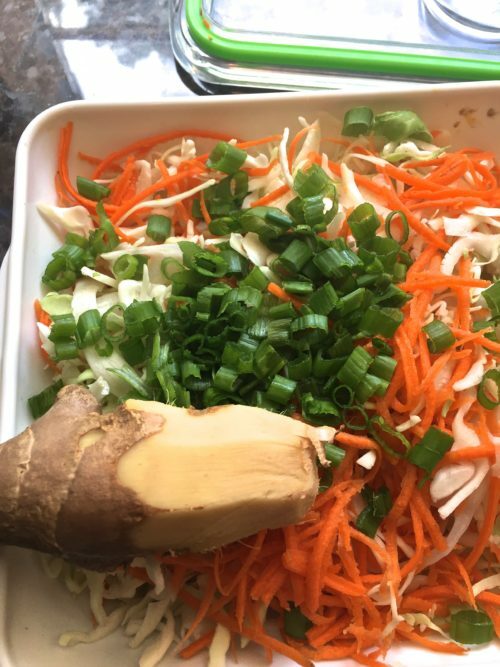 Mix the finely cut cabbage and carrot together in bowl. Add the 1 teaspoon of sesame oil and 2 teaspoons of rice vinegar and toss to coat all the cabbage mixture. (You may need a little more of the oil and vinegar to get it coated like you want it. Take the tuna (see pic above) and with a spoon start scraping the fish. This will separate the fish from the white membrane that runs through it. OR you can cut the tuna into about 1/4" cubes. 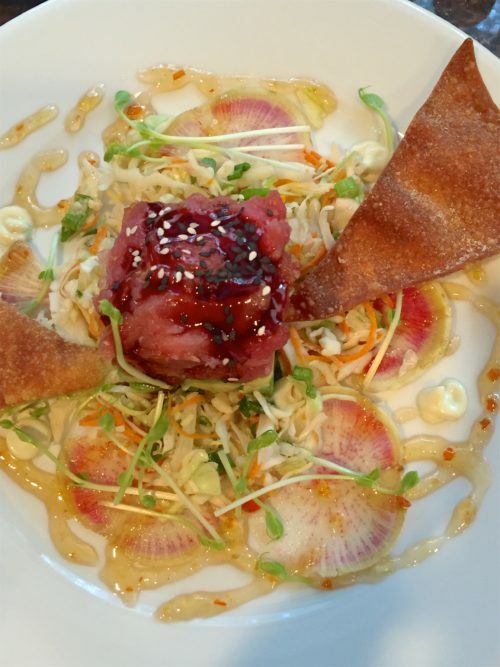 Add one teaspoon of soy sauce and one teaspoon of sesame oil to the tuna, stir and refrigerate as soon as you have it mixed together. thin slices, put in sieve and run under cold running water. This will help prevent it darkening. When ready to plate, drizzle some of the habanero peach preserves over the plate, dot with some of the wasabi aioli. Use a presentation mold, biscuit cutter or a can the size of tomato sauce and spray inside with cooking spray. Next, pack in the sliced or chopped avocado to fill half of the mold then top with the tuna mixture. It should be half and half. Press to firm the mold. Put about 1/2 cup of the asian slaw mixture into the center off the plate. Add some fried wonton crisp around the edge of the plate and drizzle with more of the peach jam. If you use a tomato sauce can or other small can you want to make sure it is the type that you can cut both the top and bottom off the can. 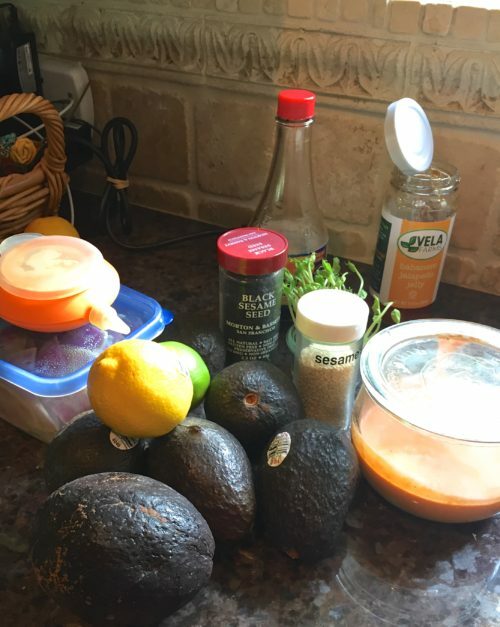 If you want to try making a spicy aioli try these ingredients -- In a large bowl, combine some mayonnaise, Sriracha, paprika, garlic lime zest and juice and a pinch salt. Stir to combine and set aside.